HUGE MULTI FAMILY YARD SALE! 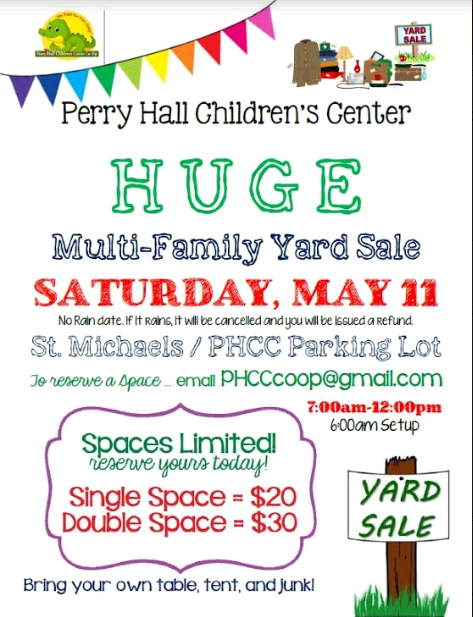 Hi PHCC Families, Friends and Perry Hall Neighbors! We will be hosting our FIRST Multi Family Yard Sale in the St Michael’s Parking lot on Saturday May 11th from 7a-12noon. Spaces are $20 each or two for $30. We will have all sorts of amazing items at very deep discounts. Spots are filling up fast so please email [email protected] to reserve your spot today! Please share, we hope to see you there!